The Fiji Rugby Union used social media to take a political stance and raise public awareness worldwide about West Papua’s right of self-determination and its struggle for independence. 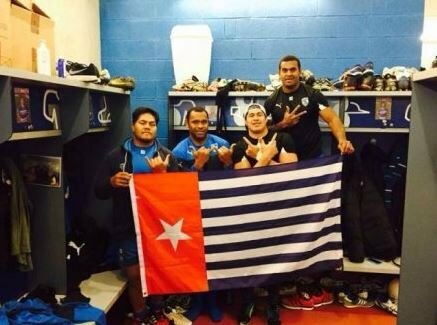 The Fiji Rugby Union posted a photo of four Pacific players holding the flag of West Papua on social media, in a show of support for the Indonesian province's independence movement. Flying Fijians players Akapusi Qera and Jim Nagusa both play for the French provincial team Montpellier, and are seen holding the flag with teammates Naama Leleimalefa and Alex Tulou. Originally from American Samoa, Alex Tulou says the presence of the campaign on social media is what brought the issue to his team's attention.